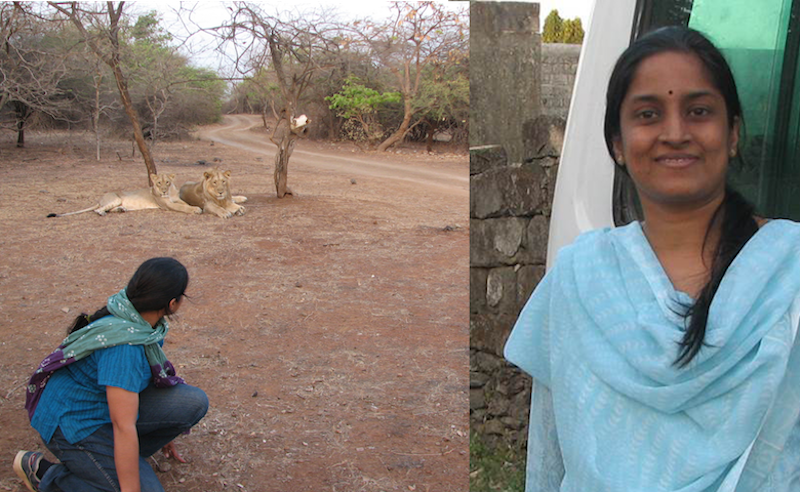 Meena Venkataraman is a wildlife biologist based in Mumbai. She is the founder of Carnivore Conservation and Research (CCR) which works towards carnivore conservation with a focus on Asiatic lions. Please give us an overview of your academic and research background. I have a bachelor’s degree in Zoology, M.S. in Ecology and Environment Science from Pondicherry University and a PhD from Wildlife Institute of India. My doctoral dissertation examined the social behaviour of Lions. I have set up my own organisation Carnivore Conservation & Research (CCR) in Mumbai. CCR is a conservation research organisation working to contribute to the knowledge and conservation of carnivores with a focus on Asiatic lions. CCR proposes to undertake consultancy and research projects related to these topics. A PhD degree which is achieved after many years in research is a milestone as well as a crossroad that is not different from the previous ones starting from high school to post graduation. At each stage, the path has to be chosen based on scope, skills and interest. As one walks the academic path, the options get fewer with little help or vision in the system itself to sustain competent, experienced scientists. For a good post-doc to transpire, a research scholar has to find the right partnership with another scientist having similar interest and working culture. A post-doc affiliation will often not be very different from the PhD experience - that is, compulsion to align to boss’ or lab’s research objectives.Thus, getting a funded project, a suitable lab/work environment where one can pursue one’s own creative path is very challenging and time-consuming through a formal post-doc engagement. There is a lot of debate on whether PhD scholars should continue to work on their research topics and there have also been discussions on this topic in this forum. In my case, there were two reasons for carrying forward my research and I am sure these are applicable to many others as well. Ideally, research projects should progress in a logical sequence – conception of the project, defining objectives, designing methods, logistics planning, completing administrative and bureaucratic formalities, field data collection and analysis, and final report preparation. Typically, a wildlife biology student may join a project at any one of these stages and is often unaware of what is happening to the planning and execution of the other stages. Studies in wildlife biology are complex, multi-disciplinary and also have to accommodate conservation themes with academic enquiry. Every student who has completed a PhD is sure to have misgivings about his or her own data, sample sizes and overall quality of research often for reasons that have the least to do with his or her application and hard work in compiling the data. The reason for this may be many - ranging from lack of cooperation from institute/supervisor, incompatible research objectives with overall project goals, malfunctioning equipment added to numerous other challenges at the field level. In my case, the variables in the way of smooth functioning of the project were so many that could probably crash a super-computer! It was not easy to study an endangered, charismatic species such as the Asiatic lion. So clearly, there were a lot of incomplete research ideas that I was interested in further taking on after my PhD. I felt that I had the desired experience and knowledge and was capable of taking this project through this logical research process. After this became clear to me, the decision to go independent followed. Lions are fascinating social cats that show a remarkable plasticity in their social behaviour across their range. For my PhD, I was able to study Asiatic lion social organisation with special reference to male lions and their reproductive strategies. I am trying to come up with optimum human-wildlife coexistence models. Hopefully, I will be able to meaningfully contribute to conservation and management through my research work. I have raised funds through small grants and have not looked at large grant options so far. In the future, as I develop my basic infrastructure and succeed in building a strong team, I will apply for bigger grants. What have been the major advantages of being an independent researcher? The biggest advantage is to be able to conceive and implement my ideas without being interrupted by other goals or interference from any quarter. I have been able to set hard targets and carry on the way I want. Having said that, my previous experience of having worked at the Wildlife Institute of India has helped me along the way in attracting scientific collaborations and other formalities at the field level. Have you faced any difficulties because of the lack of an institutional affiliation, especially with respect to funding, permits, or collaborations? Individual integrity and others’ appreciation of it alone is not enough when one speaks of getting grants for research. I have had some setbacks in applying for grants, especially from government sources. In these cases one has to be affiliated or set up collaborations with scientists who are formally employed as faculty in universities or other government agencies. Do you think, having an adjunct faculty or any other honorary position in institutions are of any help? Yes, that would help. It would mean financial stability, access to varied grant sources, and the freedom to mentor and involve students in ongoing research projects. Do you feel this is a financially stable career option? There are a lot of things that determine stability. One, your idea –good or relevant – should appeal to a funding agency. These days research grants are topical and priorities may change from year to year. I wouldn’t say it is a stable career option to start with but with persistence, one can make it so. A lot of will-power, self-belief, skill and of course a little PR is required to be successful in the long-run. It depends on who wants to become an independent researcher and whether the choice is because of personal compulsions (unable to relocate to other cities or women who need flexible timings to manage families) or because you want to be your own boss and lead the research. Success would depend on how much experience/expertise, goodwill and contacts you have built in the profession and at what age you make this decision. So, either you choose this path because of personal circumstances or because of your desire to pursue something on your own terms. Either way, independent researchers should be prepared to continuously raise grants, for spells of “no funding” and anticipate various other setbacks they would be likely to face due to lack of institutional backing. Scientists in wildlife research who want to be “independent researchers” should have the determination to find ways to survive for themselves, and ideally, also for the forests and wildlife they study.